Largest species of the dolphin family. It is found in all the world's oceans, from the frigid Arctic and Antarctic regions to warm, tropical seas. Size comparison against an average human. Orca are versatile and opportunistic predators. Some feed mostly on fish, and other populations hunt marine mammals, including sea lions, seals, walruses and even large whales. 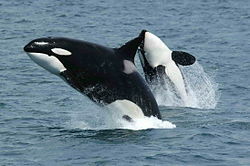 There are up to five distinct Orca types, some of which may be separate races, subspecies or even species. Orcas are highly social; some populations are composed of matrilineal family groups, which are the most stable of any animal species.The sophisticated social behaviour, hunting techniques, and vocal behavior of Orcas have been described as manifestations of culture. Although Orcas are not an endangered species, some local populations are considered threatened or endangered due to pollution by PCBs, depletion of prey species, captures for marine mammal parks, conflicts with fishing activities, acoustic pollution, shipping vessels, stress from whale-watching boats, and habitat loss. Wild Orcas are usually not considered a threat to humans. [There have, however, been isolated reports of captive orcas attacking and, in at least one instance, killing their handlers at marine theme parks. Orcas are sometimes mistakenly thought of or labeled as whales.